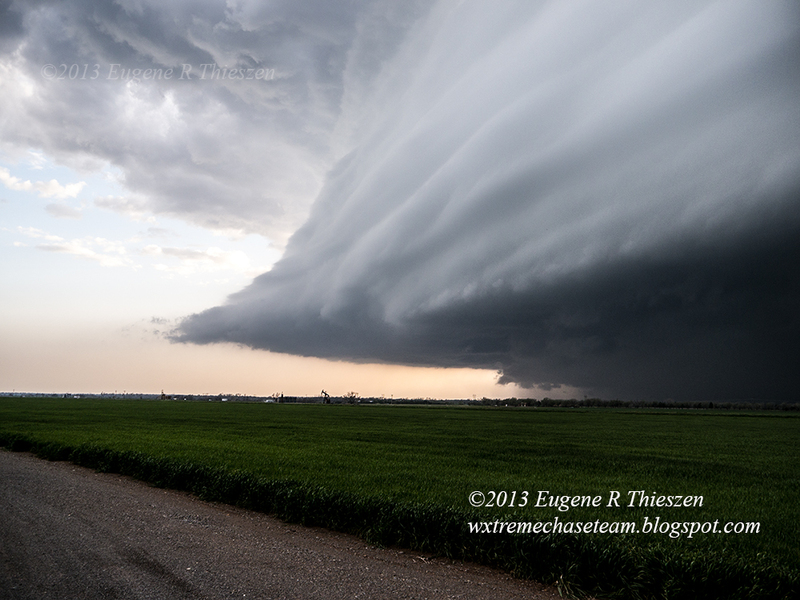 Eugene and Jason met up in Clinton, OK at around 5:15 CDT to head out toward already ongoing storms in NW Oklahoma. Our expectations were not high, but we believed we might see some well-structured supercells. A storm near Vici that had moved in the from the NE TX panhandle went severe shortly after we got on the road, but with development occurring S and W of that storm extending toward I-40 it was a bit difficult to decide which storm to target. North of Clinton we elected to compromise and headed W on SR 33 toward Hammon, thus deferring our decision a bit as storms continued to develop. At Hammon, we turned N toward Leedey on SR 34 and at that point elected to head back E on SR 47 with the severe storm near Leedey in view and the more northern storm which appeared to have a large meso-cyclone also in view. 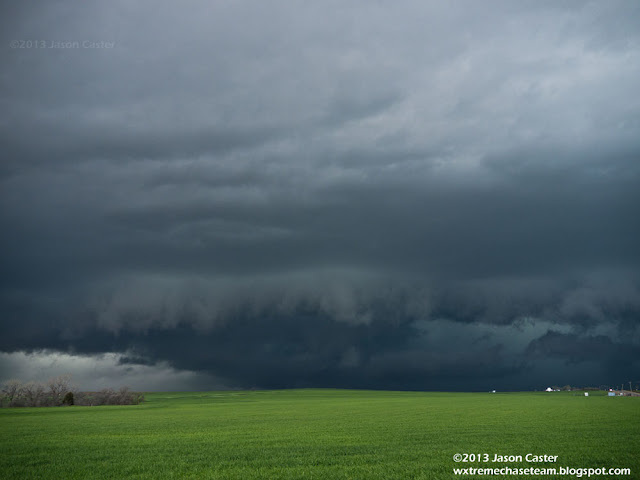 A brief tornado was reported NW of Putnam by Tim Marshall at 6:31 CDT and though we had the wall cloud in view about 7 miles to our NNE the contrast was too low for us to see the tornado. At this point the storm showed signs of gusting out, so we proceeded S on US 183 stopping along the way for some photographs. At this point we elected to move to intercept "tail-end charlie" which had developed W of Elk City, traveling S to Clinton then W on I-40 and then S toward Burn's Flat on SR 44. The storm began to show some magnificent structure and we pulled off onto a church yard on the S edge of town to take some photographs. This storm, as well, began to quickly gust out so we raced S to get ahead of it, eventually turning E on SR 55 at Sentinel and paralleled the supercell on its east-southeasterly track. When we hit SR 54 at Lake Valley, darkness was falling, so we elected to call the chase rather than stay with the storm as it continued on E and SE, eventually doing some damage on the E side of Anadarko.